The report aims to discover how climate change is affecting marine life—a task made harder because much remains unknown about the regions ecosystems. A far-reaching assessment of Arctic marine biodiversity has identified ways that sea life, from tiny plankton to huge whales, are responding to the fast-changing climate. But the report, produced by a working group of the eight-nation Arctic Council, also has significant gaps where biological data is missing and trends are unknown. But even those gaps provide important information, said scientists gathered in Anchorage at the annual Alaska Marine Science Symposium. “We’ve really done a lot of work to identify what do we know there and what do we not know there,” said Rosa Meehan, one of the team leaders for the State of the Arctic Marine Biodiversity report, said at a special conference session Thursday. 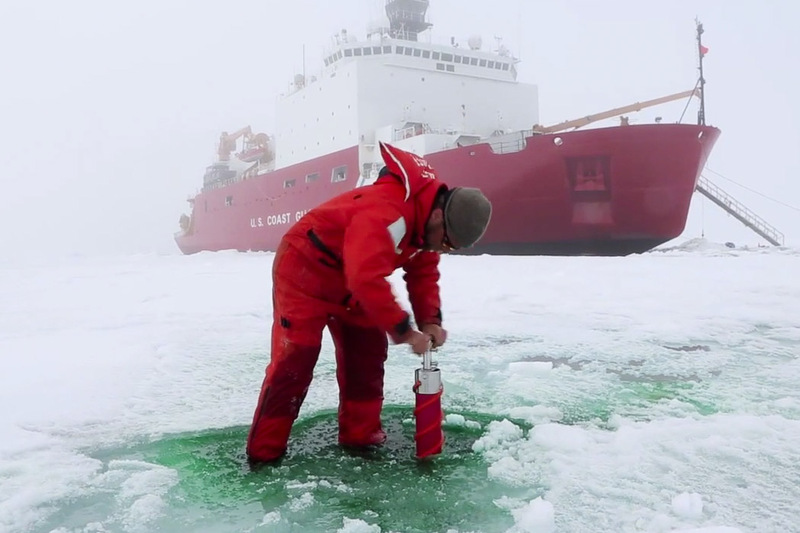 In 2014, a team of scientists headed to the Arctic Ocean to observe and document a massive plankton bloom, that had incredibly formed under the sea ice. A new report underscores how much scientists still have to learn about the life in the region. The report is part of a series issued by the Arctic Council’s Conservation of Arctic Flora and Fauna working group. Other elements of the biodiversity report focus on tundra, mountain and freshwater ecosystems. The report should be useful to policy-makers and managers, said Meehan, who recently retired from the U.S. Fish and Wildlife Service, where she helped manage Arctic marine mammals. Work to fill in the gaps will continue, and there should be more analysis of the way human uses, such as increased vessel traffic, are affecting biodiversity, she said. Some of the information gathered for the report falls outside of climate-change monitoring. There were more than 2,000 types of phytoplankton identified in the project, for example, a more detailed assessment than has ever been done at the circumpolar level, said Russ Hopcroft of the University of Alaska Fairbanks and a member of the team that submitted the plankton information for the report. There is no comparable baseline to which that inventory can be compared, Hopcroft said at the Thursday meeting. “In this group, we can’t even begin to talk about how the Arctic is changing because the window of what we know is so short,” he said. There are some overarching trends detailed in the report. Diminished sea ice is having ripple effects, diminishing food supplies for many Arctic-specialized species like ice-dependent ivory gulls, but making it attractive to more southern species that have been moving north, like killer whales. Arctic cod, a keystone species, is being pushed north and potentially squeezed out by other species like saffron cod that are moving north. Some ice-dependent marine mammals, like Barents Sea harp seals and Greenland Sea hooded seals, are in noticeably poorer body condition than in the past. But trends can vary widely by geographic location, according to the report. Among fish species, for example, high-fat capelin, are on the decline in the Pacific Arctic but increasing in the Davis-Baffin and Hudson Bay regions of Canada. Some geographic areas, like the Atlantic Arctic basin, have been better studied than others. And there are some types of marine life that have been poorly monitored, the report found. In most parts of the circumpolar Arctic, there is very little information available about sea ice biota, the report said. One of the challenges to developing a complete picture of Arctic marine biodiversity is the difficulty in getting information from Russia, the scientists said. “Russia’s signed on. They’re supposed to be contributing,” Hopcroft said. But many of the research programs there are underfunded, and there is a historic reluctance to share information or participate in exchanges, he said.